This is the companion piece for Starsweeper, the painting I posted last week. Ultramarine blue (in glass, it is cobalt) is my favorite color, and many of my pieces feature this wonderful hue. So this is for Paint Party Friday's question, do you have a favorite color? The answer is an enthusiastic yes! Two years ago, both Starsweeper and Spring Cleaning were badly damaged while in the care of a neglectful gallery owner. They are tucked in a corner in my studio and I haven't had the heart to look at them since. This summer, though, I'm going to gather my courage and look at them to see if I can repair them. I'd love to have them back. Love the face of the moon, how the broom emulates the feathers and all the subtle cracks /textures. Also nothing like a red dress! So is she the one that starts our day? What an exquiste illo! Absolutely beautiful..and a wonderful take on today's prompt. This is truly a page out of a children's book! How beautiful. Such wonderful detail and fun! It's great! very sweet; all of your work is lovely. This is pure magic! Absolutely beautiful! Thanks for stopping by, Indigene, and for your lovely thoughts! You are incredibly talented! Your drawings and paintings have so much life and emotion in them. They make you want to sit and wonder. Spectacular piece. I love the imagery and gentle feel. Hi Lynette!!!! love your piece and I started to do my Spring Cleaning!!! love this time of year....like a fresh new start!!! this is so nice, love that blue. The colors in this piece are very striking! This is just grand....a whimsical fairytale land. I love everything about it! Gorgeous work! They are damaged? Can you paint a new version? They are so charming! Both these paintings are so beautiful, and like others said, magical. So pretty! Looks like it's right out of a book. Great attention to detail and lovely texture. You have such a beautiful whimsical style- I LOVE it!!! Beautiful and whimsical! You'd think a gallery owner would know how to take proper care of paintings. It makes me angry just thinking about it! I love this painting. The red dress is just awesome! Great work! 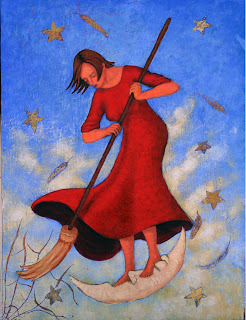 I like that she is sweeping. Very nice. Have a great weekend. I love this painting, love the idea.. This is a beautiful painting. I really like the thought behind it! Thanks to everyone for all your kind word and encouragement about the repair. La Abela, I wish crackeleur (sp?) were the problem. These pieces have that, but it is a lovely effect. The problem here is it looks like a child has taken a blunt instrument and scrawled across the work, taking off several layers of paint and gold leaf. Gosh, I get a knot in my throat just thinking about it. I'll post before and after pics, if I get the courage to look at them! Gorgeous work, I love the expression on her face. It is no wonder that you want these beautiful paintings back. Beautiful peice; so sorry to hear it was damaged. that is a shame, hope you can repair her and get her back on the wall!